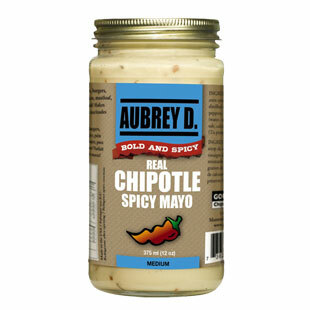 Try the velvety heat of the Real Chipotle Spicy Mayo from Aubrey D. Rebel. This Mayo has a rich silky texture and a warming smoky taste. All ingredients: whole eggs and morsels of the finest chipotle peppers are of the highest quality. Aubrey D's Real Chipotle Mayo is low in saturated fat, cholesterol and contains no trans fat. Use in sandwiches, on french fries, in salad dressings and why not on your fish? Silky smooth mayo with the spicy bite of Chipotle. A twist to the creamy taste with a hint of spicy and smoky flavors making it unique and delish. Use it on sandwiches, French fries, fish and other side dishes as an add-on and dip. Use it as a spread or dress up your salad for a creamy, filling experience. Enough heat for the chili heads who desire a spicy kick and teary-eyed awesomeness. Mix and match with various ingredients to make unique dips and add-ons. Low in saturated fats and cholesterol making it a health-friendly choice. Handcrafted in small individual kettles to bring out the very best in flavors and tastes. Made using the highest quality, all-natural ingredients that lend a fresh flavor and aroma.